What’s all this about, then? 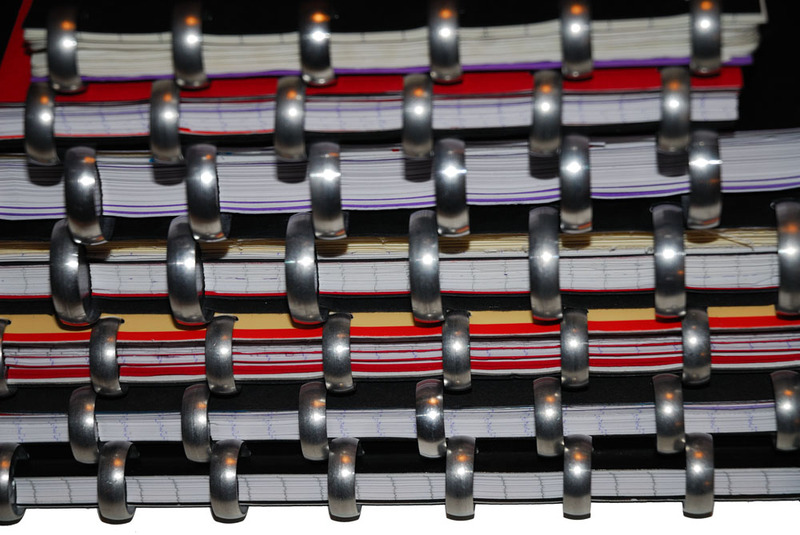 Well, when you have notes strewn hickledy-pickledy all over different parts of a notebook and you want to re-arrange them, generally speaking you can’t – unless, that is, you have a flexible binding system which allows you to pop pages in and out as you jolly well please. The trouble is, most of the binding systems commonly available destroy the paper quite quickly and make a fearful mess, and that wretched two-hole system which is almost ubiquitous on the high street is the worst offender of the lot. Surely previous, pre-computer generations must have wrestled with this problem too? Well of course they did, and they came up with an ingenious solution too, using a row of little holes shaped like mushrooms and simple discs to hold them all together. Hang about, when did all this happen? About a century ago, or thereabouts. The exact moment of inspiration is hard to pin down, but the main claimants to fame are André Thomas and Andre Martin, who devised the concept for Papeteries Georges Mottart some time between when the company formed in 1923, and when the patent changed hands in 1948. The names of the inventors supposedly formed the handy brand Atoma, and the company of the same name still sells about a million notebooks a year in its native Belgium – with the rest of the world getting a modest 20% of its output. So, that patent must have expired by now? It certainly has, whatever date you start counting from. That hasn’t prevented a little flurry of claims, counter-claims and litigation in the US (check out Levenger vs. Feldman if you want the grisly details), but these days it’s open season. Atoma itself is still going strong, and also produces the Adoc presentation-binding system; Atoma notebooks are available in the UK via Cult Pens and the occasional Adoc product reaches Amazon. 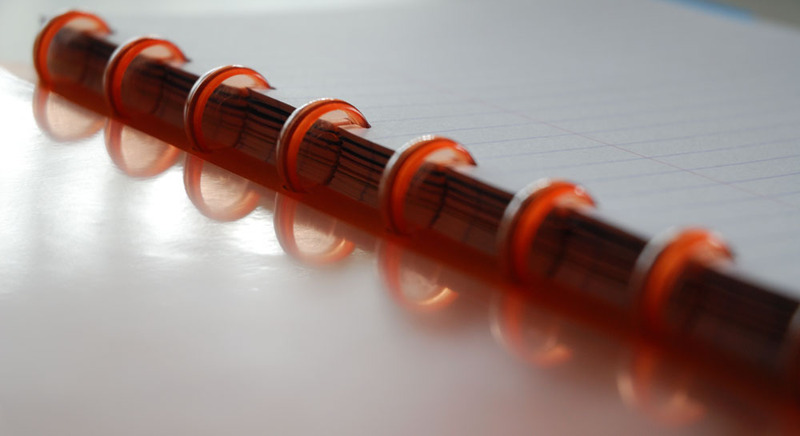 Clairefontaine in neighbouring France (known to us all for Rhodia paper) makes the Clairing notebooks, which are also sporadically available in Britain. A kibbutz in Israel made Flic notebooks using the system until the mid-1990s but threw in the towel, citing far eastern competition and the reluctance of German customers to accept non-biodegradable plastics – but not before significantly muddying the waters for US disc-binding suppliers Rollabind and Levenger (see court case above), who both still seem to do thriving business selling the system to the north American market. 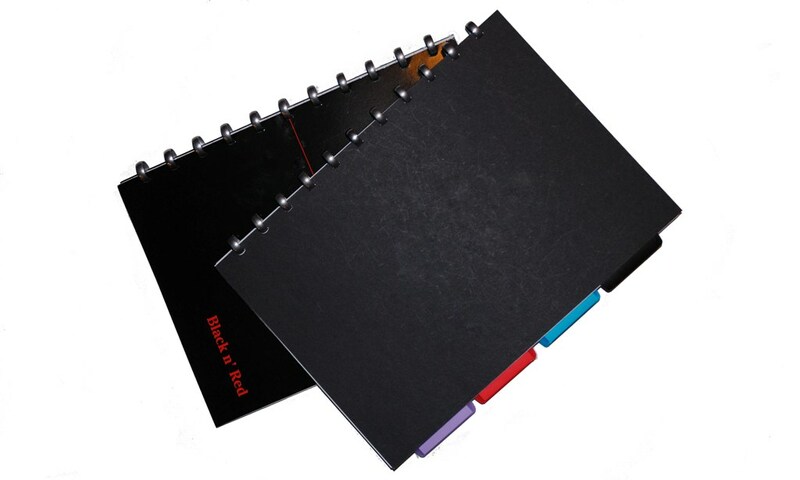 Staples have exploited the patent expiry to produce a budget disc-binding system in China, and Filofax has recently started marketing a similar system employing less robust wire loops rather than solid discs (as also produced by Miraclebind, who rather unnecessarily miss one of the holes in the row). Finally, this open season has sparked some serious custom loveliness right here in Blighty, but we’ll save the best for last. Atoma notebooks are available in the popular A5 and A4 sizes as well as a fairly handy pocket A6 version (NB for quite large pockets!). 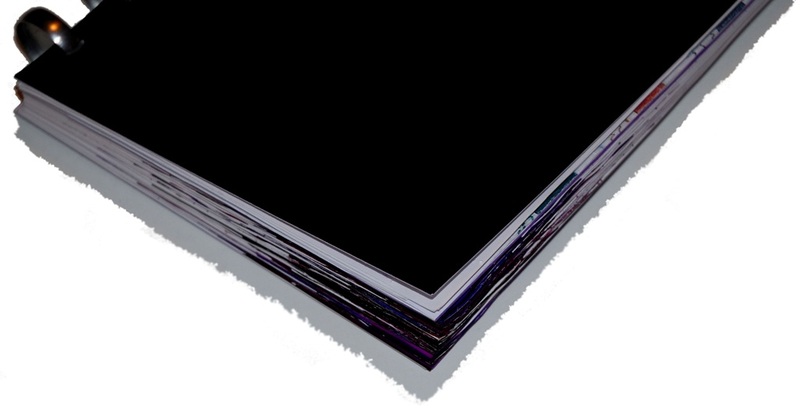 Although their basic offering uses plastic discs in a pleasing range of colours, it doesn’t cost much to trade up to tough and shiny aluminium alternatives, available in three rising sizes to accommodate the ever-bulging fruits of one’s feverish scribblings. As Ian discovered, there is nothing to prevent the cheeky insertion of Atoma’s nice metal discs into disc-punched paper provided by competitors, so there is ample room for customisation. We find the standard cream paper (which is a bit wider than standard A5/A4 sizes) to be fairly good, albeit with a bit more texture than is perhaps ideal; not the most hostile to fountain pens, but not actually the most FP-friendly either. Clairefontaine’s Clairing notebooks do much the same thing as Atoma’s cheaper plastic-disc notebooks, albeit with Clairefontaine paper, which by popular consensus is for most purposes is about the best there is. They come with handy subject dividers as standard, too. 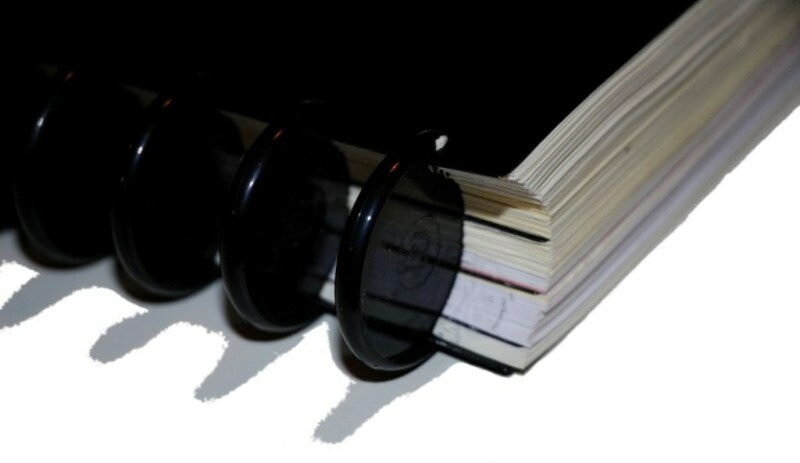 There are a few flies in the ointment, however; the plastic rings could do with a polish so that they turn easily, the enormous margins rather get in the way, and the peculiar decision to go much wider than standard A5 size means that the paper would have to be trimmed-down to fit other disc-bound notebooks. Bizarrely, the rear of the package proclaims a Patent Pending number (not a chance, sorry) – but hopefully Clairefontaine will read the material above and let that go. Thanks to the quality of the paper and the nice subject dividers, it has potential. Staples’ Arc notebooks are made in China, but on this occasion that shouldn’t necessarily put you off as a customer. The rings are cheap plastic, but available in enormous radii which make for affordable archiving at least – and the big surprise is the Arc paper, which is remarkably good quality; inexpensive, a good weight and non-feathering when attacked with a big wet nib. William Hannah notebooks are made right here in Britain – well we did say we’d save the best for last! Their guiding genius felt the same frustration with notebooks which don’t come apart and go back together and, after a few kitchen experiments, realised the disc-binding system was the answer. Then he rebuilt the concept from scratch to make a notebook that justifiably claims to be ‘luxury’. Italian leathers sewn in Leicestershire, stainless steel discs engineered in Nottinghamshire (with a retaining pin to keep the whole thing together even without paper in it), and marketing from the centre of the country by a fountain pen enthusiast who has found a secret stash of good paper and will even print lines, dots or grids in a colour of your choice. Now, this sort of combination is never going to be cheap – it’s the other end of the price scale from a cheap basic Arc, obviously – but it looks and feels the part, and if you want to turn up to a meeting with a notebook which makes a fitting accompaniment to your posh new fountain pen, why not have one that’s properly British? …and now you want one too. Don’t say we didn’t warn you! Hang on, you missed the DIY option! Big, cripplingly expensive and seemingly impregnable, it was never going to be any match for a moment’s onslaught from precision German engineering. But enough about the Maginot Line. 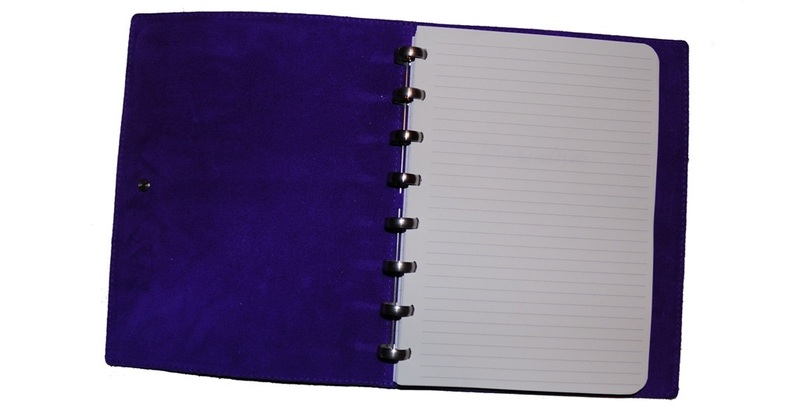 Atoma also make a big Belgian punch for home use, which enables one to make up A4/5/6 binders with any paper that suits; Clairefontaine writing pads work very well, for instance. The twin catches of this arrangement are that it can only handle a few sheets at once (even thick card will flummox it), and it costs an eye-watering £139 at UK retail prices. On balance, the compatible Arc punch at £34 is probably a safer bet for now, although we think there is room for some competition at a better price than Atoma and greater sturdiness than Arc. It works for A4 too, with Optik paper in the bottom example here, and Clairefontaine on top. So your recommendation is? Check your piggy bank, see which of the above options fits, and go for it. It’s a great system and will put you satisfyingly in control of something, however daft the rest of the day may be. I have both Staples and Atoma files, a Staples punch, so thanks for the info about the British option. I have the William Hannah version (love it so much) and the Atoma version – their pages are too wide for the WH by the way. Or maybe it was the version I bought? Just got one to test out before I bought the WH. I love this system, and have all systems including the Filofax/MiracleBind and the William Hannah offering. The great thing is that I have the Staples punch and a guillotine, so can use any choice of paper. The William Hannah binder is lovely, and the paper excellent. I have the Atoma notebook and love it, but the punch is a ridiculous price, however Staples no longer seem to sell their Arc punch. Any suggestions on a punch option? I’ve seen the Levenger ones on Ebay from the US but there seems to be some query on whether they’ll work on A4 size when the US letter size is the default. I really can’t afford the Atoma one! The William Hannah notebook looks stunning, by the way..
I’ve just recently seen an Arc hole punch in staples. They also sell them online so could get it that way. Janes agenda sells a portable punch on her website for about £22. I think it’s level her and does all sizes. Thanks for the tip-off, Shona. I’m guessing you mean this: https://janesagenda.com/products/portable-punch That looks like it may have slightly differently-shaped holes from the Atoma / William Hannah standards, but probably with the same overall spacing so it should work fairly well. It would be good to know if anyone’s tried it. I’ve read mixed info about which punch will work for which system. For instance, there was even something about the Arc punch working with Filofax refillable notebooks (the ones with the wire ring spine). Can somebody please give me a clear answer as to which rings / discs will work well with the Arc punch? Thank you. Hi Sarah. The Arc punch reportedly works with any notebooks which use the disc-binding system; this includes, Arc, Atoma, and William Hannah (all of the above will sell you discs in the UK which should work with paper you have Arc-punched). The Filofax wire-bound system, by definition, does not use the discs – so there’s more of a risk of being tied-in to a proprietary system (and thus a lower range of paper options) there. And does an Atoma’s sheet fits with Arc’s rings ? Because I have an Arc planner (the Happy Planner) and I want to know if my Atoma punch is compatible with Arc’s rings. Grateful for confirmation that the Arc punch will truly work with Atoma binders. I’ve read that some punches make 11, others 12 holes, and I’m now truly confused. Is the spacing consistent between the systems? Similar question for the Levenger punch, which looks more substantial than any of the others. The Levenger punch is hard to come by in the UK, but as far as I know they, Arc and Atoma all use eleven holes for A4, and eight for A5. The spacing is certainly consistent for Atoma, Arc and William Hannah (although the shape of the hole varies very slightly). Well! THAT was educational! I had NO idea there was so much to it! And a fully British option is FANTASTIC! I must have myself a little experiment – thank you for all this fab detail! I would like to buy disc in the 1000’s and like the metal option. The Atoma disc look nicer than the Levenger version. The challenge I am having is buying the metal disc in large quantity. I don’t want to have them manufactured myself. Do you have any suggestions? Yes! Try here: http://www.esquoia.com/product/disc-binding-rings/ The 20mm aluminium rings are almost identical to those sold by Atoma, and there are decent discounts for bulk purchases. Thankyou – I think this is what was looking for. Katriona, which firm are you referring to? Esquoia?